NaBloPoMo: It’s Not The Voting That’s Democracy; It’s The Cocoa. I voted yesterday. I brought Em with me and we voted together. I thought we’d turn it into “A Thing”. I’d teach him what it means to vote; take him into the booth with me; introduce him to democracy. We’d share an American moment—mother and son. I called Toby (aka my brain). He isn’t yet stupid from having a second child. He informed me that we failed to update our address. So our polling place was actually a mile or so away. It was a brisk morning, a scant 38 degrees. And I could have driven but I needed the walk. I mean, I really, really needed the walk. I need about 100 walks. You see, on Monday I had a check-up. I hadn’t been to the doctor in over six weeks. And even my doctor raised an eyebrow whenever she saw the scale. My doctor is a friend of mine. She’s seen me through some of the best times of my life and some of the worst. She’s pretty forthcoming with me at this point. And I’m pretty OK with that. I’ve put on a lot of weight. Too much. My body is failing and I’m only a little over 25 weeks along. I have trouble walking up stairs. My knees ache. My hips hurt. I’ve got those little purple veins. (Varicose? Or are they different? I’ve been told they’re different from the ones on the inside of my right knee. Either way, they’re ugly.) On Sundays, after standing for 8 hours at school, I feel completely blasted. I remember feeling this way with Em, but it didn’t happen until I was 36 weeks along. I have 10 more weeks before I get to that point! That’s insane. We walked. I pushed the stroller. I even took the long way to get there, the scenic route through Greenpoint. It was a lovely morning overall. I’m not complaining. Em and I discussed what it means to vote. 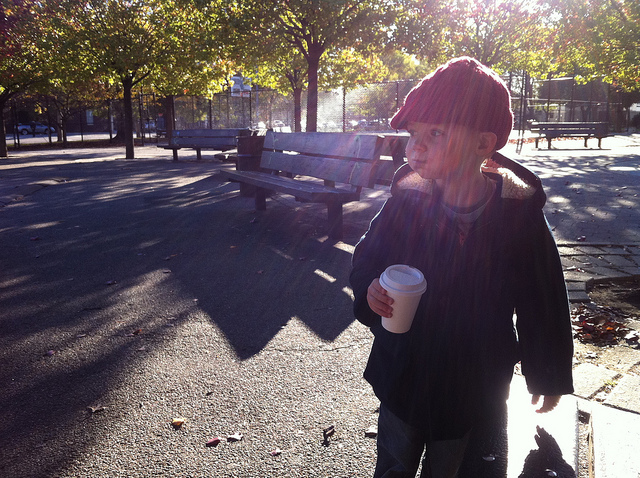 And I promised him that after we were done, we’d get hot cocoa and hit the playground. We arrived a little after 9 AM. There was no line, but the place was full. I was a little surprised at how smoothly it went for me get signed in especially considering I no longer lived at the address listed. But it worked out well. Some of the volunteer ladies cooed over Em asking if he was there to vote and who he might be voting for. He just nodded a lot, unsure of why we were spending our morning in an elementary school basement. I tried to keep him apprise of everything we were doing, but it’s hard doing several things at once when you’re getting dumber. Whenever it came my time to vote, I brought him up to the booth with me. He nodded from underneath his winter hat. I filled out my ballot and then flipped it over to vote on proposals. Em helped me feed the ballot into the machine. We thanked the volunteer and moved along. “Did you have fun?” I asked him as we were exiting the school basement. “But hot cocoa isn’t boring. It’s awesome.” He said. Previous Post NaBloPoMo: Tuesdays With Murray (Chapter 142). His Feline Friends. Next Post NaBloPoMo: Four Little Birds. I miss my pre-child brain, I am 24 weeks pregnant with my second, and I can barely form sentences that make basic sense. :( My sister has two and we make fun of her dwindling intelligence constantly….will this be me in a couple years! Amy: so you’ve noticed it too? I start saying something these days and I have no idea what words come after the first or second one. It’s disconcerting. What’s nature’s reasoning behind this? Look, if you haven’t forgotten that cocoa is awesome, then all is well. Seriously. haha and I wrote this entire comment in the “Your Site” section above before realizing it was in the wrong spot! The future is looking very bleak…hopefully I will become so stupid I will not remember what it was like to once be smart…Ignorance is bliss, or something like that.